Whether you follow a structured curriculum from one of the major VBS content providers or create your own, there will be times that you'll want to add some extra activities. We can help match your theme to support your message. Give Laurie a call at 602-820-8030 and lets talk. We've been helping children's ministries like yours meet the needs of your community since with wholesome family entertainment since 1990. 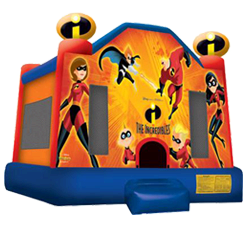 Choose from over 70 styles and themes of inflatable games, bounce houses and water slides. We have everything you need to entertain any age group this summer. We have Bounce Houses that will fit inside your Gymnasium, Sanctuary or Meeting Hall. All you need is to let us know how tall the ceilings are and we can suggest the right size Bounce for your setting. We can also set up on the parking lot or any grass or gravel area outside if you are wanting an outdoor activity to help the kids blow off some steam. What better way to cool off on a hot day than to add an element of water? We have water slides of every size as well as water tunnels and giant slip n slides. Want to engage the kids in some extra fun? How about a dunk tank that they can dunk the Pastor, Youth Minister or their favorite Camp Councilors? We also offer a reverse dunk tank where the participant sits in a chair under a bucket of water. Hitting the target releases the bucket drenching whoever is sitting below. We have a crazy water balloon game too. The Hydro Blaster pits two players against each other. They pump up a water balloon as fast as they can that hangs over their opponent's head. The winner enjoys bursting the water balloon drenching their friend! We started bringing our Ponies and Petting Zoo animals to visit children at Churches , Schools and Birthday Parties way back in 1990. In fact our name "A Child's Joy" was inspired by the joy we experienced watching these kids interact with our furry friends. We offer a variety of ways for your group to include this for your little ones. Call us at 602-820-8030 for more info. "The Animals of Bethlehem" is a wonderfully educational visit from our petting zoo that incorporates breeds that were historically kept at homes and farms on that first Christmas. This program is popular during the Christmas season but we offer this "hands on" approach to history and Scripture year round. It can be a great addition to your Vacation Bible School too.